Jo Crowe listened to songs written by TSAI Members. Critiqued songs and selected one for further consideration. To find out more about TSAI click HERE. Milton Gunzberg and Shelly Lee visited Nashville. Milton performed at The Bluebird Cafe and Taps and Tapas, then both performed at the Commodore and Roosters. Crowe Entertainment provided entertainment for the Nashville Easter event held on March 30th. Veteran Daniel Dean and Brad Marley performed to overwhelming applause. 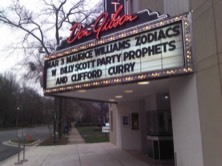 Clifford was a guest performer at a Maurice Williams concert held at the Don Gibson Theater in Shelby, NC. Clifford performed at Douglas Corners at the artist show presented by the Nashville Music Guide.